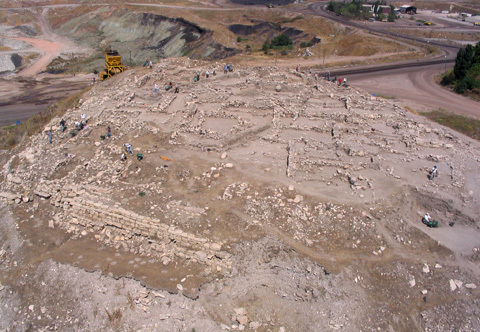 Seyitömer Höyük is located 26km north of Kütahya, Turkey, within property owned and operated by the Seyitömer Lignite Company. The marker points to the location of Seyitomer (use the +/- keys to zoom). The ancient habitation mound measures c.150×150m in size with its summit at a height of 23.5m above the surroundings. The site was being cleared and studied under the direction of Prof. Dr. A. Nejat Bilgen, the chairman of the Department of Archaeology, Dumlupınar University (with the assistance of members of the Lignite Company, students and faculty from other departments at Dumlupinar University, [the late] Prof. Samuel M. Paley, University at Buffalo, and Learning Sites, Inc.). The site had been previously excavated briefly by various other teams during the 1980s & 1990s (in 1989 under N. Aydin [Museum of Eskisehir]; in 1990-1992 under A. Topbas [Museum of Afyon] and in 1993 under A. Ilasli [Museum of Afyon]). Additional background can be found on the Archaeological Settlements of Turkey (TAY) Website. As of 2009, settlement activity has been detected from the following periods: Roman, Hellenistic (334-30 BCE), Achaemenid (500-334 BCE), Bronze Age (c.3000-1200 BCE), and the Late Chalcolithic period (4th millennium BCE). There was one really serious problem facing the archaeological team when work begun again early in this century: as much of the mound as possible needed to be excavated and documented by the end of 2010, because there is a 12-million ton exploitable coal reserve underneath the mound that will be mined by the lignite company thereby destroying the habitation site completely ! providing publication-ready images as the field seasons progressed. Some of our results can be viewed on these pages. 1991 Seyitömer Höyük Kurtarma Kazısı 1989. I. Müze Kurtarma Kazıları Semineri, Ankara, Turkey, May 19-10, 1990, pp.191-204. 2011 Seyitomer Hoyuk kazisi on raporu, 2006-2010. Kutahya: Dumlupinar Universitesi Fen-Edebiyat Fakultesi Arkeoloji Bolumu. 1996 Seyitömer Höyüğü 1993 Yılı Kurtarma Kazısı. VI. Müze Kurtarma Kazıları Semineri. Didim Turkey, April 24-26, 1995, pp.1-20. 1994 Seyitömer Höyüğü 1992 Yılı Kurtarma Kazısı. IV. Müze Kurtarma Kazıları Semineri. Marmaris, Turkey, April 26-29, 1993, pp.297-310. 1993 Seyitömer Höyüğü 1991 Yılı Kurtarma Kazısı. III. Müze Kurtarma Kazıları Semineri. Efes, Turkey, April 27-30, 1992, pp.1-30. 1992 Kütahya Seyitömer Höyüğü 1990 Yılı Kurtarma Kazısı. II. Müze Kurtarma Kazıları Semineri. Ankara, Turkey, April 29-30, 1991, pp.11-34. © 2009-2019 Learning Sites, Inc.